In the previous post I introduced ideas from Ray Cashman and Lewis Hyde about the circulation of gifts, and participation in a gift economy. I found their ideas deeply interesting because I could identify the operation of ‘luck’s penny’ in my own life, and in our research into folklore. Further than this, though, it raised questions about my work as an artist and writer and our work as quarto. I was involved in a project some years ago called Troubling Ireland. Convened by Danish curatorial platform Kuratorisk Aktion for socially engaged artists and curators and focusing on colonialism and capitalism, the question of poverty arose more than once. Curator Tone Olaf Nielsen talked of how her position in what has become known as the ‘precariat’ – a class of people earning their living precariously through short-term project work, with periodic unemployment and much unpaid work undertaken to maintain access to relevant opportunities – adversely affected her mental and physical health and her family life. All participants recognised and largely shared her experience. There was anger, but also resignation. In the end, she carried out the performance as ‘an autonomous action’. Hyde’s thoughts made me realise anew the importance of siting creative (textual, visual or other) work within a gift economy, for encouraging fluid interchange and freedom of expression. Some creative work is commercially valued and some is not, but artists should be able to make their work and live by it regardless. A recent column by Suzanne Moore in The Guardian points to Milkman author Anna Burns’ dependence on benefits from when she ran out of money writing the book up to the moment when she won the Man Booker prize this year. Burns is thankful that the support existed, but at one time had to go to court to continue getting it (https://www.theguardian.com/commentisfree/2018/oct/22/anna-burns-shows-working-class-talent-waste-milkman). Referring to social media posts labelling Burns a ‘scrounger’, Rhiannon Lucy Coslett writes, ‘Let those people moan. It’s a symptom of how often creativity is seen as an indulgence until it pays off. If it’s not part of the market, it doesn’t matter.’ (https://www.theguardian.com/commentisfree/2018/oct/22/anna-burns-man-booker-prize-food-banks). Market value is only one among many indicators of value, and a limited and capricious one at that. Reading The Gift clarified for me that artists should not have to depend on the market to survive – though some can and do engage successfully there – but rather on society as a whole placing a monetary value on their day-by-day work. This is because artists need time to make work. At the level at which I operate as an artist, my time is not valued. In one grant I was offered £400 for photocopying and nothing for my time. Taken to its logical conclusion, the idea that artists do not deserve support while making work that may or may not have market value suggests that only the financially independent should work as artists. One of the uplifting aspects of our work as quarto is that our experience, skills, effort and time are valued. We place specific monetary values on them in order to make a living from them. As quarto we propose these monetary values as acceptable reflections of our professional worth, and clients accord us that worth. Artists need a similar (though distinct) context of accepted value in which to exercise their gifts, and to exercise them day-by-day in the process without which outcomes are impoverished. I participate in gift economies and am happiest and most fulfilled doing so in the context of peer-to-peer exchange. When I give away work – in written, visual and other forms – for free to institutions or to clients, I do it by conscious choice, carefully considered, and not just because it is expected of me. Getting paid and paid fairly for quarto projects has helped me set parameters for how I value all forms of work I do. Ray Cashman, ‘Luck’s Pennies, Witch Hares and the Hungry Grass: Community and the Social Environment in Irish Folklore’, paper given on 20th June 2018 at American Conference for Irish Studies, University College, Cork, and Lewis Hyde, The Gift: How the Creative Spirit Transforms the World, Edinburgh, Canongate, 2006. 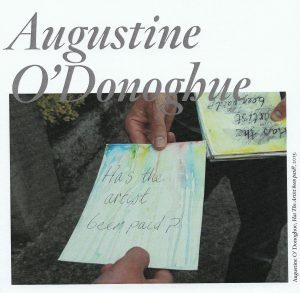 Augustine O’Donoghue, ‘Has the Artist Been Paid? Proposal for Circulation Exhibition’, pp66-69 in Liz Burns and Clodagh Kenny (eds. ), Art and Activism, Dublin, Fire Station Artist’s Studios, 2014, p69.